If you have any concerns about your possible need in the future to cancel your reservation, you may want to consider purchasing travel insurance. Some insurance companies even offer policies that allow you to cancel for any reason. We receive absolutely no commission or payment of any kind for our referral to this site and it is completely up to you if you want to purchase this type of insurance, and if so, as to what type of policy you select. We are simply providing this information as an option for our guests to consider in order to protect their vacation investment. A Non-refundable deposit of 20.0% of the total rental amount must be received to confirm a reservation. Full payment of the rental balance due is required no less than 30 days prior to the check-in date. A security deposit of $750.00 is also required and will be authorized on your credit card 7 days prior to arrival. A charge may result for any damage to the condo, any evidence of smoking inside or outside on lanai, missing contents, missing keys, evidence that large furniture has been moved (ie. sofa, loveseat, tables, beds, etc. ), a need for excessive cleaning and/or for exceeding the number of allowed overnight guests (maximum guests allowed is 4). The Reservation Deposit is non-refundable. Cancellations made more than 60 days prior to the check-in date can have the deposit applied to a stay of the same dollar amount or more at the same Aloha Condos property within one year of the original check-in date. (subject to availability and new applicable nightly rate will apply) Such changes to reservations are subject to an administrative fee of $50.00 . Cancellations made less than 60 days prior to check-in will forfeit all deposits. Cancellations made less than 30 days prior to check-in will forfeit all deposits and all rental balance due payments. Any permitted reservation change will be subject to an administrative fee of up to 5% of the accommodations total, or a minimum of $50.00. Check-out time is anytime before 11 AM. Please be certain to plan your arrival and departure days and times accordingly. Early Check-in or Late Check-out may be available for an additional fee, subject to pre-approval by owner. Guests shall respect and follow the Kanaloa at Kona "House Rules" , which include observing quiet hours from 10:00 pm to 7:00 am. Smoking is strictly prohibited in the condo or on the condo lanai, and doing so will result in full loss of security deposit. Kanaloa at Kona Resort is a 100% Non-Smoking and Non-Vaping property. A maximum of 4 overnight guests are allowed in this condo. Falsely representing less guests than are actually staying will result in loss of all deposits and is grounds for immediate eviction. No large furniture is to be moved (ie. sofa, loveseat, tables, beds, nightstands, etc.) and any evidence of such will result in loss of deposit. A fee of $25 per towel will be assessed for any missing beach or bath towels. Tampering with any area or cabinet locked off from guest use will result in forfeiture of Security deposit. Please make sure all keys are left behind at condo. We charge a $50 replacement fee for each key. Please take out all garbage (kitchen, bedrooms, and bathrooms) before you depart. Have a relaxing stay and a vacation that is filled with special memories ! What a beautiful condo! We had such a wonderful, relaxing time here. It has a great view of the ocean. We ate breakfast on the balcony each morning, listening to the surf while watching the people in kayaks and on paddle boards. The condo is attractively decorated, has a well-equipped kitchen, comfortable beds -- everything was perfect. This was our third visit to the Big Island and this was the nicest place we've stayed at. Highly recommended. Thanks for everything, Lonna! "Aloha and Welcome to Paradise!" Resort has three (3) beautiful pool areas with jacuzzi spas; including an adult-only pool, 2 lighted tennis courts, several BBQ areas, and covered unit assigned parking. Golfing Nearby — Kona Country Club - Course recently rennovated; Enjoy spectacular views! Spacious lanai for outdoor dining. Aloha! I have been vacationing in Hawaii since the late 1960s. I have stayed in all types of places and have spent time on each island. With that being said, this condo is one of the loveliest and well appointed places I have spent time (3 weeks) in. First, I love the location and privacy of the Kanaloa resort area, yet it is close to a shopping area which will meet all your needs and the Kona Country Club (public) for great golf. This area is so well maintained with the three pools, BBQs with each area, club house, tennis courts, and the grounds are beautiful with their Hawaiian foliage and scenes of the ocean. Second, the Condo 3602 is located above a beautiful cove where each day the ocean is amazing. Every morning I drank my Kona coffee on the lanai and greeted the day in a stunning setting. Third, the Condo is beautiful. So tastefully decorated, so comfortable (the beds are wonderful for a great night's sleep), and every amenity for enjoying your stay (the kitchen is fabulous), and everything you think you might need is already there (soaps for kitchen or washing machine, dryer pads, plastic baggies/wrap, paper products, games, reading books, towels for the pool, etc.). Truly, spending time in Condo 3602 is paradise living in the paradise of the Big Island. And, lastly I really appreciated how the owners were timely with their answers to my questions, employ a housekeeper who keeps the Condo in pristine condition for the guests, and a caretaker who is available to help if needed. A true daily joy of living in Paradise. Mahalo and Aloha! This condo is truly beautiful. The view from the lanai is spectacular. As someone who prefers to eat in, the kitchen had everything you could possibly think of. The pots and pans were high end as were a lot of the utensils. The beds were super comfortable and the bathrooms, both master and guest were lovely. Mike and Lonna are so easy to deal with and are truly concerned that those staying in their condo have everything they need.You will not find a nicer condo on the island for the price. I would highly recommend this condo to anyone who is planning on staying in the Kona area. The highlight of our trip to The Big Island was spending time at the condo. It was in a beautiful gated community and the grounds are immaculate. We loved sitting on the patio for breakfast and then again at dinner and watched the waves in the Bay. The condo was outstanding. Lonna took care of all of the details. The condo was beautifully decorated, spacious and had everything we needed. We loved our master suite. The bathroom was beautiful and has such a comfy bed. I want the closet! Our friends stayed in the second room and there were two single beds – I am sure they were pushed together. The kitchen was the best – seasonings, oil, flour, sugar AND then so much cook ware and bake ware – the best was the Ninja blender for our smoothies. Lonna took such great care of us. From the very beginning she personally answered all of our questions and went out of her way to ensure we had information on all of the islands we visited to the wonderful treats and card upon our arrival. I would not stay anywhere else. Thank you Lonna for sharing your home with us. Kanaloa condo 3602 is exceptional! The condo looks new and is decorated beautifully, the view is magnificent, the sound of the ocean is heaven. There is a good separation of space between the neighboring building, and although there was a family of 5 staying on the second floor above, it really didn't bother us! The beds were super comfortable, the linens and towels high quality, and the kitchen was equipped with everything one could need. There are some books and games and beach towels (and even hand weights!) for guests to use, and in the shed outside are boogey boards and beach chairs. The development is nice in that it is gated, there are 3 pools, 2 tennis courts a hot tub, and BBQs here and there and it has beautiful grounds to walk around. Very convenient access to all that Kona has to offer, the airport, etc. Lonna was generous with the aloha spirit before, during and after our stay, and was quick to respond to all of our needs and questions. We can't say enough good things about our experience and hope to return soon! Many business associates of mine have stayed in this condo over time and the report I heard over and over was, yes we would go out and do great stuff on the big island, yet we couldn't wait to get back to the condo. As my mother used to say, "there is nowhere as nice as your own back yard". and when it comes to this condo, I think she was right.The view is wonderful, the condo has amenities we couldn't have anticipated. Binoculars in the front closet. Super clean, and I couldn't have thanked Lona enough for actually sending a text during the week about a lettuce recall. Wonderful host, wonderful condo, great location. Our only regret was we didn't stay longer. I don’t know about you but sometimes when a night out is perfect I hesitate to try and duplicate it because it often falls short the 2nd time around. Well we chose to stay at Kanaloa at Kona in condo #3602 6 years after our first visit. I didn’t think this stay could possibly exceed our previous experience but it did! While checking off all of the vacation boxes for relaxation, ocean view, pool time, convenience, great restaurants nearby etc this condo and it’s owner Lonna went above and beyond making us feel at home. We went to several of her, “mostly for locals” restaurants, including the Holuakoa Cafe which was a special night for us. When we stayed in and cooked the kitchen had every necessary item and when we went to Magic Sands and Two Step beaches the condo had every accessory including chairs, snorkels and an umbrella. There were DVDs, books, board games, and tennis racquets. The only disappointment was that we only booked one week. We thoroughly enjoyed our stay! Lonna was excellent.. Very easy to get holld of. Very friendly and accommodating. The condo had everything we needed.. And more.. Beautifully decorated. Four of us had lots of room and privacy. . The location was excellent... Very quiet.. The pools were very clean.. The whole complex was very clean.. And quiet when we were there.The location was very handy for shopping.. Restaurants.. Beaches... This is one of the nicest condos we have ever stayed in.. Highly recommend it!!! Mahalo!!! Condo is spacious, clean and extremely well organized. Kitchen has everything one could want. Beautiful view and very close to great beaches. Thank you so much Lonna. This condo was the perfect getaway for my family of four (husband, 2 teenage daughters and myself). This was our first time on the Big Island and we could not have been more pleased with location, amenities, the grounds, and the wonderful owner. Lonna was the perfect hostess and communicated with us from the time we booked until we left the island. From the minute we walked in, we felt like we were in someones home. The kitchen was stocked and the decor had the perfect Hawaiian touch without going overboard. We spent most of our days touring the island and loved coming home to the comfortable, spacious condo and just relaxing on the beautiful Lanai overlooking the water. The breeze and views were spectacular. I would absolutely return to this exact unit and recommend to my friends. Thank you Lonna for a vacation we will not forget! The condo was great. It was well furnished and like new. Good location near shopping and ocean view. Definitely recommend a vacation to Kanaloa at Kona. Wow what a fantastic place!!! From the very beginning we were impressed by not only the condo itself but also the way we were treated by the owners and Aloha condos. When entering the condo we were treated to a nice welcoming note with complementary water, chocolate covered macadamia nuts, kona coffee, and a beach bag! Really sweet! Then we looked through the condo and were ecstatic at the accommodations. We have stayed in lots of condos through the years and this was by far the best ! The lanai over looks the water and was the place we spent every morning with a cup of coffee . The kitchen was stocked with everything you might need to help you out cooking if you so chose, such as spices, utensils, pans etc... At night we relaxed in great comfortable beds. On one occasion I had a question for the local contact. He answered immediately and had a solution. All and all if I could give this place a 10 Star out of 5 Star I would! I also would recommend to anyone going to Kona! We definitely agree with the five star rating on this condo. Beautifully appointed, very clean, a kitchen that is better stocked for cooking than many private homes, and a beautiful location on Keahou bay. It is located in a perfect spot for activities both north, south, or in Kilua-Kona; and after a days activities it is so nice to cook a meal, relax on the lanai and watch the manta ray viewing boats and the beautiful lights of the hotel across the bay. Lonna and Mike are very gracious hosts......they pay attention to the details that make the difference between a good and an excellent place to stay. The condo grounds also include an ocean front pool with great views. This condo is a lovely stay on the west side of the Big Island! The perfect Condo in Kona! We love to travel to Hawaii every year and the Big Island has become our favorite island and now we have found the perfect condo to stay at on our annual trip to paradise. It is gorgeous furnished and decorated, super spacious, and has super comfortable furniture. If you have stayed in condos in Hawaii you understand. Plenty of room for a family of 4 to have space even on vacation. We loved the Lanai which was situated right on the water with waves crashing and boats and dolphins passing. Perfect for sunrise coffee every day. We know the area well and the location of this condo is absolutely perfect to be close to all the great things to do while in Kona. You are right down the street from the boat launch to Captain Cook, which is best snorkeling spot in all of the islands by a mile. A short drive to downtown Kona for shopping, nightlife, and great restaurants. Lonna helped us to discover some new little gems "The Coffee Shack" just up the road in Captain Cook overlooking the most spectacular ocean view and with adorable green geckos and great french toast! Must see! Kahaluu Beach Park which is just a few minutes from the condo had great snorkeling and very shallow easy waters to navigate if you have little ones or first time snorkelers. We were surprised how many fish there were and how close they let you come. Turtles too! Lonna the owner is the sweetest and most helpful. She has another beautiful condo in the same complex with a pool and sunset view (2602). We plan on trying that out next year! We stayed at Kanaloa for 10 nights and really enjoyed our stay. The condo was perfect for us (2 couples) as we explored the greater Kona area. We were thrilled with how well appointed the condo was and enjoyed having everything we could possibly need (from kitchen accessories to beach chairs and towels) right at our finger tips. We were weren't exploring or at the beach, we enjoyed playing tennis, recreating in the pool areas, grilling a locally raised, grass fed tenderloin, and sipping Kona coffee every morning on the lanai. Lonna was extremely helpful and communicative in the pre trip planning and our post trip communications. Thank you for a wonderful visit and we hope to return soon! The condo was excellent. The place was decorated very, very nicely. Everything you needed was right there. The view from the balcony was excellent. I would highly recommend this location and this unit. Thank you for providing such a wonderful place for us. Everything was top notch. Your condo was lovely and provided us with everything that we needed to make our stay so comfortable. I would highly recommend this to anyone looking for commendations. Hope to come and stay with you again. Stayed here for three weeks. Condo was plenty large enough with lovely furniture. It was very well stocked with all the fun stuff for adventures; the binoculars were a particularly nice touch. Location overlooking the bay was awesome! Watching the waves crash while having a morning coffee was a great way to start the day. The unit was very well equipped with all utensils required for cooking. Community BBQs on property were great for meeting people from different places and learning about their Big Island experiences. Only thing stopping this from being a 5 star was the internet connection. My Surface had lots of problems staying connected; frustrating when trying to plan events. Absolutely beautiful condo, well-appointed kitchen along with updated bathrooms. Views from lanai are exceptional. Tennis rackets and balls, beach chairs, umbrella, boogie board and coolers all provided. We've stayed in #3602 several times and can't wait to return each time we leave. We absolutely love sitting on the lanai and watching all the activity in the 2 bays. You will never be bored staring at this ocean. The condo is exceptionally well stocked with every item any tenant could possibly need and the owners/on island contact are very prompt to respond to any requests. Never have we seen any type of "bug" - IT IS SPOTLESSLY CLEAN. We do love the front door porch geckos who love to sun themselves in the afternoon sun and greet us after a day of adventures. Could not ask for a better location, condo or owners to deal with. My husband and I had the most comfortable stay at Lonna and Mike's condo. I will go out on a limb and say it is probably the nicest condo at Kanaloa. It is very tastefully decorated and the lanai has the most perfect view of the ocean. Very private. We loved having coffee on the lanai in the morning and seeing the manta ray boats every night. The kitchen is fully stocked with everything you could possibly need as well as beach essentials and more for everything else. All of the equipment was in excellent condition. I also would like to say that Lonna was so kind to communicate with me before, during and after our stay to make sure we had everything we needed. I cannot recommend this unit highly enough and would most definitely consider staying here on our next trip back. Mike and Lonna, have made this Condo a very special place for those special moments in your life. It is a very comfortable and homey place to stay. The Lanai is more private then most due to the location of this Condo. The view is great from the Lanai as well as the couch inside. At night we would sit on the Lanai and watch the Boats come in for the Manta Ray Dive in front of the Sheraton. We watched several dolphin pods go by the mouth of the Harbor. When the whales are going through you can watch them as well. We sat on Lanai watched the Sunrise over the hills and drank our coffee in the mornings. It is close to great snorkeling at 2 step at Honaunau Bay , Kahaluʻu beach park located off of Ali’i Drive in Kailua-Kona And Hapuna Beach State Park. I highly recommend this Condo for you special times in Hawaii. This is a wonderful condo we have stayed at twice. The beds are very comfortable, kitchen well appointed, and the lanai has a wonderful view of the cove. We sat had had breakfast every morning on the lanai listening to the waves crash. There are chairs, snorkel equipment, boogie boards, coolers, etc. everything you could need for an unforgettable stay. Will be comming back! We have stayed in Hawiian VRBO condos in the past but Kanaloa at Kona, Condo 3602, has been by far the nicest location to date. Not only was the private location a bonus but the upgraded condo itself was beyond our expectations. The quality furnishings, appliances and decorating decor certainly enhanced this 5 star space. The condo itself was excellent but the communication and prompt responses to any queries we had with the owners was well beyond anything we have experienced before. The Perry's went out of their way to make our Big Island vacation a joy and memorable experience. We would highly recommend this condo and dealing with Mike and Lonna will be an added bonus. Our family of three stayed at this condo for six nights in February 2017. We were impressed by how well equipped and comfortable the unit was. Also, it looks out over a secluded bay. It was peaceful and relaxing and we would highly recommend this unit. way better than we ever expected! Pictures do not do this beautiful place justice; it is simply gorgeous, inside & out.The pools were very clean & water temperature perfect.Our condo was outfitted with everything you could possibly need, from kitchen equipment to umbrellas, to huge beach towels, & more. This condo was top notch! Beautifully decorated with above average appliances and a view that is out of this world! Any issues a rising from our stay were promptly dealt with. Great communications with the owners and local caretaker. The amenities on the complex are well kept and the employees are very helpful and pleasant. Would highly recommend this unit! We had a great stay for a month at Kanaloa at Kona, Condo 3602. We have stayed many times at the complex and we have found that unit 3602 is situated with the optimal view of all the units at Kanaloa, and the best lanai for "baywatch" over Heeia and Keauhou bays. There is always activity and it is a great place to start and end every day. The condo has absolutely every single detail covered, it has everything you might need to go for a week or multiple months without feeling like you are missing anything. The owner has also done an amazing job with the furnishings and the decor, it feels like home and not like a rental. My wife and I would highly recommend this condo, it is our favorite in all of the Hawaiian islands. This is our second time visiting Kailua Kona and both times we chose Unit 3602 at Kanalou at Kona. This unit is located ideally on the property for privacy and beautiful views of the ocean and bay from the large lanai and living area!! The complex and grounds are very well maintained, as are the three pools and hot tubs. The condo has many special touches of the Hawaiian culture and is beautifully decorated. The kitchen is large and well equipped with everything a gourmet cook would need. The beds are top of the line and very comfortable. Both bathrooms are extremely large and beautifully tiled. We so enjoyed staying here and will definetly be back soon. Mahalo Lonna and Mike for sharing your incredible 'Hawaii Home' with us. These are a few of the many reasons we give your unit a 5 Star Rating. We had the pleasure of staying in 3602 for 8 nights. It was very comfortable for our family of 4. We found the condo to be very nice with high quality furnishings and decorations. Upon arrival it was spotless. A nice note and a small welcome gift greeted us when we walked in. We felt very welcomed. They turned the A/C on so it was so relaxing when walking in! The bathrooms where super nice! A/C was wonderful. The kitchen is well stocked. Parking is free. The community is quiet and very well kept. 3602 sits right up off a secluded cove and has a beautiful view of the ocean. There are no structures between you and the water. We enjoyed sitting on the lanai taking in the view. A path near the neighborhood takes you down to the cove which is nice for snorkeling. Each of the 3 pools are nice! The location of the condo is great! It's a three minute drive to a little plaza that has great food such as pizza, sushi, steak, Mexican and coffee. It's a five minute drive to a wonderful snorkeling beach, Kahaluu Beach Park, where we saw turtles. Five more minutes down beautiful Ali'i Drive and you're in Kona! We love Kona! It reminds us of Lahaina. This was our first trip to the Big Island and we loved it. We've been to Maui twice. We put 1,000 miles on our rental car exploring the island. We recommend Ride the Rim ATV tour and Poke a Stick lava tour. We enjoyed Quinns Almost by the Sea and Scandinavian Shave Ice in Kona and the Coffee Shack up on Mamalahoa Hwy. Bianellis Pizza in the plaza by the condo has very good pizza. Peaberry & Galette Coffee in the same plaza was a first stop every morning. They make crepes too! We were not as impressed with Bongo Bens or Lava Java in Kona. Lonna made the whole experience super easy. We couldn't ask for a nicer place to stay! We look forward to returning- hopefully for a month next time!! One of our favorite things about our condo is its unique location within the Kanaloa Resort, and the fact that it affords a great deal of privacy. Like you, we love the relaxing sound of the waves and the spectacular view of the bay and ocean from our lanai. We will look forward to the day you return! I just would like to say that your condo was perfect for our stay in Kona. From the ease of booking and the great information provided prior to our visit you took care of everything. We loved the condo and the location. The size of the rooms and the lovely updates in the kitchen and bathrooms made us feel like we were staying at a friends home and not some impersonal hotel. We came and went at our leisure and enjoyed the ground around the complex including the Oceanside pool. You thought of absolutely everything when stocking the condo including all the household items but including the sporting and beach equipment. You had items in the closet storage that I didn't even know I would need but was glad to find. (sun umbrellas, binoculars, games etc). so nice to not have to include all that stuff in the travel luggage. Only downside was having to leave. Would recommend your condo to anyone heading to the Big Island. What a great experience. Before during and after our stay. The check in directions were perfect and we arrived with zero issues. There was a problem with our stay though, it seemed to go by way too fast and was over before we knew it. Condo facilities were outstanding and we especially liked the Oceanside pool and hot tub. The condo itself is an exceptional bargain when compared to the price of any hotel with a full ocean view. The condo and condo grounds are very well maintained and there is even a small fresh herb garden that can be used if you decide to cook. Of course with the amount of excellent restaurants in Kona you may never even have to cook if you did not want to. Fantastic stay, I really cannot fully describe just how relaxing and perfect our stay was. We will be doing it again. I would also highly recommend Bongo Ben's restaurant in Kona for breakfast. Thank you very much for your nice review. It was great to have you back once again. We are blessed to have so many wonderful, repeat guests, who enjoy the unit as much as you do. We are delighted to hear that you rate our unit as "the best of the bunch" of all the units you have stayed in at Kanaloa over the years! Thanks for letting us know about the sun shade - glad it was an easy fix and we got it taken care of quickly during your stay. Let us know when you're ready to reserve your next stay ! Kanaloa at Kona has to be the nicest vacation rental of all those in which we have stayed. 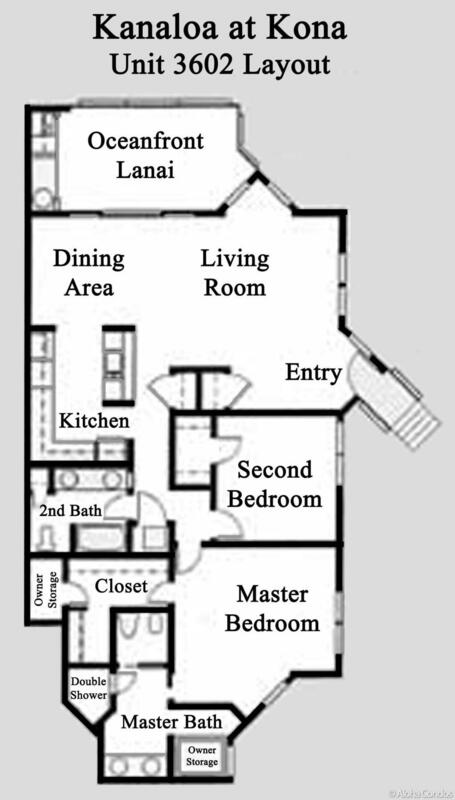 The layout/design of the condo with two bedrooms and two bathrooms was perfect for the three of us. The view of the bay and ocean from the lanai and windows was spectacular. It's every bit as nice as it looks in the pictures. The décor and finishes throughout were well done, and the condo was very clean. The condo was well supplied with paper goods, kitchen utensils and necessities - everything needed for our stay. We appreciated the welcome gifts (water, coffee, etc.) after a long flight. The nearby shopping center had a grocery store, pharmacy and restaurants that we frequented. We would not hesitate to recommend this condo to friends and family and hope we are fortunate enough to be able to return someday. Communication with the owner was always easy and helpful. A good choice all around. My family and I have been visiting the Big Island annually for the last 30+ years and spent the majority of our visits at Kanaloa at Kona. For the most part, our accomodations were pleasant but nothing to write home about. After a particularly terrible condo in 2014, we decided to spend the extra money on something that was a bit nicer on the water rather than looking at a torn down golf course. And BOY was it worth it! 3602 is by far the nicest condo we've ever had the pleasure of staying at. Not only is it impeccably designed, cleaned, and up-kept - it's also VERY well stocked (and organized!) in regards to kitchen supplies and beach/pool gear. To top it off, we were greeted with a fantastic gift tote! We plan on re-booking this condo for our vacation again this year! Thank you again for a beautiful trip! GREAT condo! We enjoyed our vacation on the Big Island and staying at this condo (3602) made the experience even more enjoyable. Right on the water. Great morning and evening views! Very easy to access and close to an array of activities and events. (Location, Location, Location) It is a very well kept condo. Modern, clean, and comfortable. Grounds are well cared for too. Wish we could have stayed longer! Looking forward to the next time. What a wonderful place to stay! Beautiful, clean, petfect location. We hope to return with my mom next year and will try to get this unit again. Thank you for a perfect stay! Very very nice condo and the view was amazing! We arrived to our Condo to a very nice basket full of fruit and muffins jams wonderful avocados and a nice welcome card! Very nice view of the bay / Ocean! The condo was great, Lonna has thought of everything you could possibly need while staying at this condo. Nice cooking ware, nice furnishings, also things for the beach,chairs towels,coolers boogie boards. snorkeling equipment You name it and it was almost guaranteed it was on site! The only thing that I was not happy with is the master Bedroom and bathroom did not get much cool air from the AC. But with the ceiling fan and the two other fans we were able to cool the bedroom. The AC worked well in the other parts of the condo! Beautifully furnished, clean, great view, fully equipped with up-to-date items, wonderful lanai for eating meals, convenient parking, quiet area and close to stores for groceries and other items. The cost was reasonable. When we arrived we saw a sign saying they would be drilling the sidewalks near our condo to refurbish them during our stay which at first concerned us. They only worked a couple days and it didn't create a disturbance for us at all. If you want a beach to swim in within walking distance, this isn't the spot. They do have several pools, including one that overlooks the ocean. This is one of the nicest condos we have ever stayed in on the Big Island. The condo is beautifully decorated and felt like home. The bed and living room coaches were really comfortable. The bathrooms and showers were great. The kitchen was equipped with everything you need - lots of glasses, dishes and pots and pans. Dishwasher and laundry soap were available for use. We took advantage of the chairs and umbrella located in the storage shed. It is a short walk down to the Keauhou Canoe Club where we went out and paddled two mornings in a double hull canoe. We saw spinner dolphins both days and were able to see them from the condo lanai when we returned. Will definitely stay here again. Condo 3602 is fantastic--high grade updates and extremely clean. Even though there was a change of ownership between the time we rented and the time we arrived, everything went without a hitch. The new owners gave us a welcome basket that was much appreciated and enjoyed. We have stayed at Kanaloa before and enjoyed the peaceful setting and this condo is by far the nicest. The view was great and we so much enjoyed spending time on the lanai. We would definitely like to return and would recommend it to anyone. Air conditioning is a must at that time of year in the cove. Needed more Kleenex....had to buy own. Beautiful view and the condo is decorated very nicely...not too Hawaiian but just enough. I usually stay in 2003 so it was nice to be away from the roaring ocean and all those stairs. Couldn't find any vases for the lovely flowers we bought at the farmers market so had to buy one which we left there. Well equipped kitchen. My wife & I vacation in Kona at least once a year. This condo costs a bit more than where we typically stay, but it was worth every penny. We stayed two weeks this time. It’s an ocean front unit with a spacious lanai positioned along a cove – so you can enjoy the waves without being awoken by intermittent pounding of being on the point. It also sits pleasantly far from any road noise. The perfect little place nestled amongst lush tropical foliage. Nice neighbors too. The grounds, pools, and BBQ areas are kept neat and tidy – and parking is reserved. The unit is beautifully furnished with quality pieces and comfortable bedding. We found all fans (except the one on the lanai, but who cares about that one), utilities, and appliances to be fully functional and in perfect working order. The cleaning staff is impeccable. Groceries, dining, and Alii drive all within walking distance. This is our new go-to vacation rental. Highly recommend. Book it while you can. We had a wonderful time at your condo, amazing view Very clean , I had to keep you information, I fact I would like to reserved again for next year. The beach is just right there. During our walk we have spotted several dolphin . Very easy access to restaurant , market , snorkel . We all have a wonderful time just seating in the lanai. Again amazing condo ! Beautiful view. We spent 4 nights at this beautiful spot just S of Kona. I read positive reviews online and they didn't disappoint. The condo was very spacious and fit a family of 4 very well. The condo's views were picturesque and we enjoyed listening to the waves crash on the rock beach. This condo has one of the best views in this location. Beds were comfy, plenty of places to sit and relax, 2 beautiful tiled bathrooms, kitchen fully equipped, lots and lots of closet space, Tv's in each bedroom (although who has time to watch!) -we didn't want for anything! They supplied beach towels and boogie boards and lots of little items in the cabinets. Also appreciated the laundry facilities and detergent in the condo. The last day we went swimming at the onsite, oceanside pool (there are 5 from what we heard). We liked being 10-15 minutes from the hustle of Kona. It's not a secluded location but it is very quiet and we didn't see hardly anyone. We would definitely stay here again! My only minor comments were that the beach umbrella has seen better days and the sand mats had been eaten through by something. But we didn't need these with the other supplies. I checked the box for aC, then changed my mind. They graciously credited my acct. When we got there we changed our minds and it was no problem starting the aC again. It was hit and miss if we really needed it, but worth the added expense. Condo 3602 was clean, with well stocked kitchen and recreational gear and the condo was the best in the 10 plus visits to the Kona coast. Ac kept the place cool and comfortable. View from the lanai was to nice to describe. The condo was beautifully appointed, very clean, comfortable, the views spectacular, the area quiet; all in all an experience we plan to repeat! We stayed at the condo during Christmas week and enjoyed every moment. We originally wanted to stay in the hotel but changed our mind and were very happy about it. There was a lot more space where we can spread out and rest after busy day. The condo is very well equiped (beach towels, underwater camera, games, dvds). Kitchen had cooking oil, vinegar, spices and condiments in the refrigerator. Everything is ready for you to cook. Beds were comfortable. Everything was clean. Outdoor patio is great for dining out day or night or relaxing during the day. The only complaint was about the bath towels. They need to be replaced. My husband and I spent a week here and loved it. The unit has been tastefully and thoughtfully updated, is very comfortable, has everything you would need, is very spacious, and has a beautiful , peaceful view of Keauhou Bay. We even saw a whale! Unit 3602 was even more beautiful than the pictures depicted! Very clean, tastefully furnished, and beautifully decorated with a spectular view of the ocean! I would highly recommend this condo to anyone wanting to visit the Big Island. Sooo relaxing...lovely accommmodation and we would do it again. We had the master bedroom and loved the topper onthe mattress very comfortable. Had everything tomake our visit enjoyable. Especially enjoyed theview from the lanai and spent lots of time there. The pools were great and the location wasvery central to the town and for getting groceries. Also good for walking. We rented this condo during our 4 night stay in the BI. From the moment we arrived at Kanaloa at Kona we were impressed by all the beautiful tropical gardens surrounding the condos. Our condo was right on the waters edge of a private black rock bay. We loved looking out from our private deck at the water. The lights across the bay at night of the Sheraton were amazing. We also enjoyed the provided binoculars to check out the turtles swimming in the bay and the outrigger trips from the Sheraton. It was quiet and private and we seemed to have the resort to oursleves in June. We loved the interior of 3602, very comfortable. Lovely furnishings, plush bed, huge bathroom and shower. The second bedroom we didnt use but it was also large with a walk in robe and there was a 2nd bathroom. The kitchen was fitted out with all the mod cons, huge stove, microwave and lovely marble bench tops. All the kitchen, bathroom accessories were well thought out. We wanted for nothing. There were beach towels, snorkelling gear, beach chairs, washing detergent, dryer sheets, spare towels and linen, sunscreen shampoo the works. This resort is a few kms from town, but no problem if you have a car. There is a great little shopping centre across the road and the cliff top restaurant is fabulous with lovely sunsets. The supermarket also helped with grocery shopping. We loved the Big Island. It has great snorkelling, and the clearest water in hawaii. We took a helicopter tour over the lava which was fantastic, we drove around the whole island which even though it is the largest island, was certainly do able. Kona is a great township with lots of quaint shops, great artworks. We also found out that King Kamehameha (cant spell his name, sorry king) was born just across the bay from this actual condo. We definitely recommend this condo, we loved it. Konaloa at Kona is a great location, quiet, beautiful view, secure resort. Condo 3602 lives up to all the photos on the internet - really it has everything. Look in the parking spot shed before buying boogie boards. There is even a cooler in the lani storage closet.I can't imagine wanting more than you get with this resort or this condo. My only reservation would be it is a downstairs unit so you can hear the folks upstairs walking around, flushing toilets etc. - you may or may not notice this depending on what you are used to. For the price - you can't beat this condo. Best condo stay - ever! Kanaloa at Kona Condo 3602 is simply the best condo (or hotel) facility we have ever stayed at. The unit was extremely clean, very well furnished, very well appointed, and had all the comforts that you would want in a vacation condo. We found everything we needed (and more) for a very comfortable stay.The view is fantastic and each of us spent a great deal of time out on the deck in comfy chairs staring at the surf, boats, weather and people in the water.The grounds are beautiful and well kept. The three pools and multiple BBQ units were always clean and in top shape.We truly hated to leave and are saving our money so we can return and stay in this exceptional unit. Many thanks to the owners and staff!! This was our first time to the Big Island. This condo was top notch. Very clean, well stocked with everything we needed. When we return to the Big Island we will rent this condo without looking at others.We loved our stay. This was our second stay at Kanaloa at Kona, and our first stay in unit 3602. We loved it! Having stayed in the same building, but different unit, previously, we knew we would spend much of our time on the lanai. Such a wonderful spot. Unit 3602 is stunning, with top notch decor throughout. In between our first stay, and the most recent, we traveled to Maui. We determined that Kona is the spot for us when you get much more bang for your buck. My only concern with this unit is the either the owners will sell it, or that it will become so popular we have difficulty booking it in the future. This was our first stay on the big island, and we could not have been happier with condo 3602. The unit was very nicely furnished, much more so than many other rentals we've used before. It was clear that the owners decorated and maintained the unit with great care. The view from the Lanai was exceptional. The overall property was also great, we especially liked the ocean pool and views. We hope to return and would love to stay in this particular unit again! It was exactly what I saw at the view site ! Everything was perfect! This was my dream.Except only two things. One is about the phone which didn't work as low battery when we arrived. The other one is I couldn't find the concierge during my stay for the private condo... I didn't know why: it might be bad timing evey each time. Anyway I satisfied very much even these two things were missing. Thank you. We just ended a week's stay in Unit 3602. We hated to leave this beautifully located condo. The unit has absolutely everything you need to make your vacation experience the best. The Unit was spotlessly clean and is beautifully furnished and maintained. The bathrooms are gorgeous! We looked at the unit online, but in person it was more than we expected. This is a beautiful condo in a perfect setting. We will be back. Beautiful location, very quiet, lovely condo. All the amenities we needed in a perfect setting. Everything was just as described, and could not have been better. Rarely saw other guests on the property. Didn't use the pools on the property. The Keauhou area of the big island is the ideal place to enjoy a relaxing and active vacation. It is not touristy like saying in town and yet shopping and restaurants are within walking distance. The Kanaloa at Kona condos get as close to perfection as is possible without owning your own unit and living there full time. 3602 in particular is the condo of choice. While the complex is very well maintained and quiet the specific location of 3602 is ideal. The lanai is directly next to a semi private cove making quick dips in the ocean to snorkel or swim very convenient. The condo is well appointed with glass tile and granite tops and stocked with all the misc. accessories like binoculars and beach coolers. Tennis courts are onsite and an additional 10 court facility is almost next door. Don't hesitate on this condo, enjoy! We had the best vacation ever. The staff was very helpful and friendly. The condo was wonderful comfortable and clean. The location was perfect. There was so many things to do on the island we could not get to them all. The view from the lanai was breathtaking. We had so much fun snorkeling in the bay we were sorry to have to leave. We have stayed in many condos over the years, but #3602 was by far the best stay! The condo is beautifully decorated with all the amenities one could possibly need or want. Our special place was the lanai with the view overlooking the cove below. My husband and I would actually play on the beach in the morning and come back to the condo in the afternoons and evenings to just spend quiet time on the lanai soaking in the tropical wonder. The Kanaloa is a quiet property and very well groomed and maintained!All dealing with aloha condo were prompt and professional. They are very user friendly as well.Beat vacation we have had in years! The picture accurately captures the view from the lanai at 3602, where we ate every single meal. The condo was incredibly comfortable, quiet, very well equipped, and easy to settle into. The view over the bay was lovely, especially in the mornings, when we even saw some spinner dolphins traveling through. We were a short walk or a short drive to fantastic snorkeling, and we did night snorkeling with the manta rays right next to the nearby Sheraton. We would definitely stay here again! This condo was great! Very nice furnishings. Really makes you appreciate a good vacation when you have a nice place to stay. The view is great. One thing we would have done was opt for the air conditioning, not easy for women to put their makeup on when it's too warm. Would go back there anytime. Thank you. Perfect view from lanai, lots of activity to whatch in small bay. Every little convenience was thoughtfully provided, and we felt just as if this was our own home. The condo was sparkling clean on arrival and every detail of booking from beginning to end was perfectly handled. We have stayed in other condos in this area of Kona and this was by far our best visit. A fabulos, spectacular Condo & Ocean Front View!!! It was all good, the Condo was beautifully decorated and equipted with everything you would require.Location was great for us and 5 minutes away were all the ammenities one would every need.Waking up to the sound of the ocean every mornig with coffee and a good book in hand on the Lania, watching the sun rise was how I spent my 1st hour of every day. How great is that!!! We stayed in condo 3702 from January 4 to Jan 20, 2012. Would have stayed longer but it was already rented. We also stayed in this condo in February 2010.This condo has everything you need. Tons of linens and towels. Great appliances and cooking utensils. It is very large. Sleeps 6 with 2 bathrooms. Absolutely wonderful view from the lanai watching the waves and surfers. Sound of the ocean puts you to sleep at night. Pictures on the net are exactly what you get when you arrive. Very comfortable. We wouldnt hesitate to recommend this condo. Can't beat the location for the price. As a main floor unit, we did find the guests above a little loud with very heavy feet. Air conditioning was a little tricky to figure out as well but after the cleaning lady came, it worked great (but we never did find out what she did). Lanai was wonderfully relaxing. Being right on the bay was also a bonus for Kayak rentals and snorkelling. This unit was beyond our expectations, the view was "wow"
We shared unit 3602 with another couple and the layout was all we could ask for. It was very quiet and we enjoyed the view from the lanai while having breakfast, reading a book, or just kicking back and visiting. The wall colors in the unit were very soothing, and web pictures we right on! Beautiful condo in a perfect location. The condo is beautifully furnished and exceeded all our needs. I loved the soft sheets. The view from the lanai is gorgeous - we never tired of watching the outrigger canoes and kayaks depart and return. It was very easy to rent the condo and extremely pleasant dealing with management. All our questions were answered and we thoroughly enjoyed our week at 3602. We'll be back in 2012!